A couple of months ago we bought one of those upside-down tomato planters you might have seen advertised on TV. I like it. It hangs right outside my window, so I get to watch it grow every day. And it’s done well. 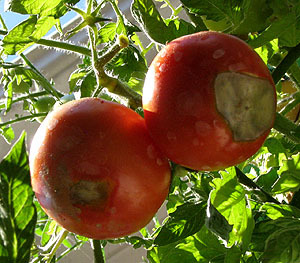 At least, we thought it was doing well until the first tomatoes ripened and we took a look at them. The top halves are all fine, but the bottoms all look like the ones in the picture: convered with a gray, pulpy mass and basically ruined. I’m not sure what causes this kind of thing. Is it a bug? A parasite? Overwatering? An alien nanobot infestation? Something else? I desperately need advice. Are there any expert tomato farmers out there who can tell me what’s going on?